Custom-Painted Mural. Unique and one of a kind ceiling when you have a custom mural hand-painted on it. 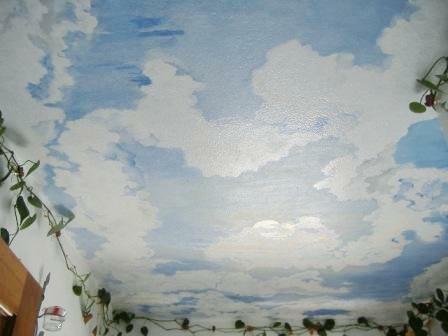 Bring the outdoors inside with a beautiful mural of a sky with clouds and the sun. Maybe add birds, butterflies, birds, bee's or even an aircraft flying over, let your mind be creative! The pricing for a ceiling mural would vary depending the size and detail required. For additional information please contact us . Sorry only orders will be taken within certain parts of Massachusetts.